Super Training is out. Horde battles are out. So, the question is what are the changes to how you can EV Train in Pokémon Sun & Moon. Things have completely changed significantly with the methods to get Effort Values in Sun & Moon, and it has never been simpler. 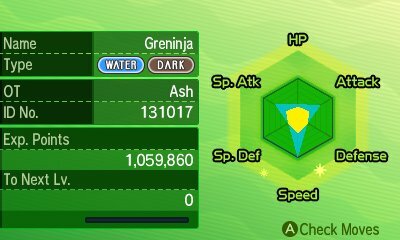 While Pokémon X & Y allowed for you to see your Pokémon's EVs on the bottom screen when in Super Training, Pokémon Sun & Moon shows it in a slightly different manner. Instead, when you go to check your Pokémon's status, you will get a graph showing its stats relative to its maximum possible ones. If you press the Y button, it will change the graph to show the Base Stats of the Pokémon in a yellow graph and the light blue shows you how much you have trained the Pokémon in the stat if you've completed training or orange if you haven't. If you have maxed a stat then it will start sparkling. 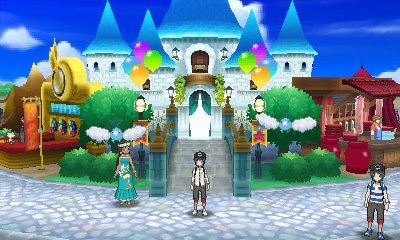 To make sure you're done, you can go to the Battle Royal Dome in the Royal Avenue and speak to a woman in there who will give you the Effort Ribbon if you have maxed out your Pokémon. Power Weight +8 HP EVs after each battle, regardless of the Pokémon fought, but cuts Speed in half. 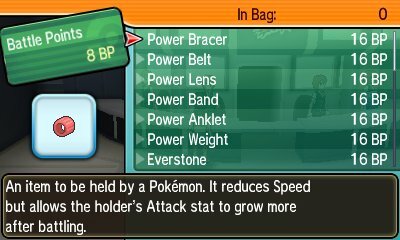 Power Bracer +8 Attack EVs after each battle, regardless of the Pokémon fought, but cuts Speed in half. Power Belt +8 Defence EVs after each battle, regardless of the Pokémon fought, but cuts Speed in half. Power Lens +8 Special Attack EVs after each battle, regardless of the Pokémon fought, but cuts Speed in half. Power Band +8 Special Defence EVs after each battle, regardless of the Pokémon fought, but cuts Speed in half. Power Anklet +8 Speed EVs after each battle, regardless of the Pokémon fought, but cuts Speed in half. With Horde Battles no longer in the game, the quickest way to get Effort Points for your Pokémon is through S.O.S. Battles. These battles have Pokémon call for wild Pokémon to assist them and so provide more opponents to fight. Most Pokémon don't change the species you encounter as you battle through so this makes them perfect chaining spots. For competitive players, there's yet another perk. As the Pokémon calls for help, the Effort Points yielded from each Pokémon are multiplied by 2 which results in the Effort Values you receive getting increased. As such, with this, a Power Item and PokéRus, you can get 36 Effort Points from one Pokémon (((1+8)*2)*2) being defeated and max a stat out in 7 KOs in a chain. HP Lunch A big bento box. It raises the Pokémon’s base HP. Attack Lunch A big bento box. It raises the Pokémon’s base Attack stat. Defense Lunch A big bento box. It raises the Pokémon’s base Defense stat. Sp. Atk Lunch A big bento box. It raises the Pokémon’s base Sp. Atk stat. Sp. Def Lunch A big bento box. It raises the Pokémon’s base Sp. Def stat. Speed Lunch A big bento box. It raises the Pokémon’s base Speed stat. The Festival Plaza also offers several options that lower the EVs in case you need to reset them. Sweets Set A It makes a Pokémon much more friendly, but it lowers the base HP a lot. Sweets Set B It makes a Pokémon much more friendly, but it lowers the base Attack stat a lot. Sweets Set C It makes a Pokémon much more friendly, but it lowers the base Defense stat a lot. Sweets Set D It makes a Pokémon much more friendly, but it lowers the base Sp. Atk stat a lot. Sweets Set E It makes a Pokémon much more friendly, but it lowers the base Sp. Def stat a lot. Sweets Set F It makes a Pokémon much more friendly, but it lowers the base Speed stat a lot. Secret Meal A A secret menu item. It makes a Pokémon much more friendly, but it reduces the base HP to zero. Secret Meal B A secret menu item. It makes a Pokémon much more friendly, but it reduces the base Attack stat to zero. Secret Meal C A secret menu item. It makes a Pokémon much more friendly, but it reduces the base Defense stat to zero. Secret Meal D A secret menu item. It makes a Pokémon much more friendly, but it reduces the base Sp. Atk stat to zero. Secret Meal E A secret menu item. It makes a Pokémon much more friendly, but it reduces the base Sp. Def stat to zero. Secret Meal F A secret menu item. It makes a Pokémon much more friendly, but it reduces the base Speed stat to zero. The Poké Pelago is the final place for you to deal with EVs, and is a far more passive area of training. When you have created the Isle Evelup, you can put in groups of up to 6 Pokémon to train on the island. The training can cover one of all of the stats. 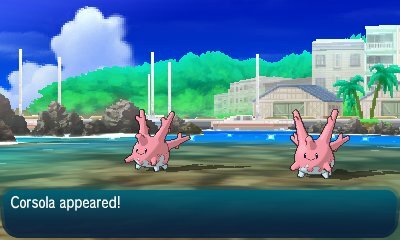 Depending on the island's level, you can have up to three groups doing different training at any one time. When you select the group, you can specify how many play sessions the group does. Each play session will take half an hour. The yield you get depends on one factor: Whether or not you placed Poké Beans in the basket on the island. 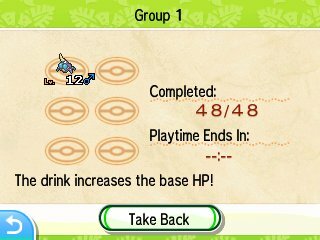 If you don't put PokéBeans out, then you will get EVs every play session, so every 30 minutes meaning to get 252 you'd need to have 63 sessions lasting 31 and a half hours. If you do use PokéBeans, then the speed you get EVs doubles, so you get EVs every 15 minutes, essentially halving the time you need to max a stat.